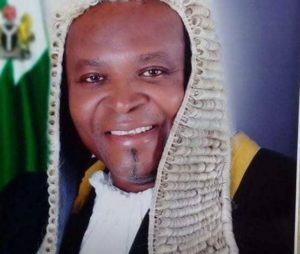 The Deputy Speaker of Abia State House of Assembly, Dr Cosmos Chukwudi Ndukwe has been arraigned before Hon. Justice C.C. Thomas Adiele at the Abia State High Court, Umuahia, by the Independent Corrupt Practices and Other Related Offences Commission (ICPC), for allegedly using his position as a public officer for self-gratification and corrupt enrichment to the tune of N54, 610, 000 (Fifty-Four Million Six Hundred and Ten Thousand) Naira. Dr. Ndukwe is alleged to have used his position as the Managing Director/Chief Executive Officer of Abia State Environmental Protection Agency between February 2007 and April 2012 to confer corrupt advantage upon himself by accepting the sum of N5, 850,000 (Five Million, Eight Hundred and Fifty Thousand Naira) purportedly as a loan from Messrs. Ancoold Nigeria Limited, a contractor with the Agency where he had served as an official, an offence that is contrary to and punishable under Section 19 of the Corrupt Practices and Other Related Offences Act, 2000. In addition, the defendants Dr. Ndukwe and his company, Messrs Conk Productions Nigeria Limited, were alleged to have received gratification to the tune of N42,750,000 (Forty Two Million, Seven Hundred and Fifty Thousand Naira) in various monthly installments between March 2009 and January 2010. He was also alleged to have corruptly accepted for himself, the total sum of N5, 000,000 (Five Million Naira) through an agent, Chijioke Okonkwo, as reward for assisting Ancoold Nigeria Limited to secure prompt payment of the contract fees for the provision of environmental sanitation services to Abia State Environmental Protection Agency.